Drill Bits & Chisels - SDS+. Drill & Flat Bits & Holesaws. Sanding - Sheets & Belts. Discs - Cutting & Grinding. Drill Bits & Chisels - SDS Max. See all items in the store. 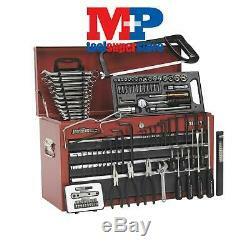 Sealey AP2201BBCOMBO Topchest 6 Drawer with Ball Bearing Slides - Red/Grey & 98pc Tool Kit. Usually dispatched within 24 hours. Package includes: - Model No. AP2201BB - Topchest 6 Drawer - Overall Size (W x D x H): 600 x 260 x 340mm - 98pc Tool Kit - Model No. Description - LED028 - Magnetic Pocket Light 6 SMD + 1 LED - S0447 - Pliers Set 3pc - S0450 - Adjustable Wrench 150mm - S0465 - Hex Key Set 25pc - S0481 - Hacksaw 300mm - S0615 - Soft Grip Screwdriver Set 6pc - S0527 - Junior Hacksaw 150mm with Spare Blade - S0562 - Combination Spanner Set 11pc Metric - S0725 - Socket Set 37pc 1/4" & 3/8"Sq Drive 6pt Metric - S0775 - Ratchet Driver Bit Set 12pc - Other products of equivalent value will be supplied in the event that the promotion items should cease to be available. You may also refer to the individual Model No. Faithfull LCR8 8 Pocket Leather Chisel Storage Roll 33 x 47cm. Draper 77589 15L Backpack Cool Bag. Stanley Tools 192902 Professional Mobile Tool Chest. Stanley Tools 197483 Stackable Sort Master Junior Organiser. Sign up to hear about latest news & offers. Mon - fri 8:30am - 17:30pm, sat - closed, sun - closed. The item "Sealey AP2201BBCOMBO Topchest 6 Drawer with Ball Bearing Slides Red/Grey & 98p" is in sale since Friday, December 15, 2017.